European Coaching Corner: 1 - How can I make my players play better soccer? 1 - How can I make my players play better soccer? Every coach, at any level, wrestles with that question. In this article we will try to answer this age old question. The starting point: Even as a youth coach you must be able “to read” a game before you can translate that information into a practice. Insight into what all happens in a game is improved if you have played the game yourself. But even if you attend a coaching course, you will get a better understanding of how to read a game. At a coaching course you will learn how to simulate the game at a practice just by simplifying the game. If you stroll around the field at youth games you can hear the strangest things shouted to the kids by the adults. The terminology used in professional soccer is used to educate the young players. Should you not talk about tactics with the young players? The great Dutch player Johan Cruyff said it perfectly, “All the young players need is a game organization. The right fullback only has to know that he has to cover the right zone in front of his own goal. The center forward/striker knows he has to play closer to the opposing goal than his own goal. No more is needed when coaching youth-players”. Simple, basic principles are all that are needed for the younger players. √ If you can play the ball forward then that has preference over playing the ball wide. √ Defending and attacking is done with the whole team. These principles create an excellent tool for a youth coach’s soccer vision. Take, for example, the starting-point, "play together". As a youth coach you can conclude from that statement that when a free kick is taken, a player doesn’t just send an uncontrolled kick into the direction of the opposing goal, but that the player who takes the free kick passes it to a player nearby, so the team stays in ball possession and tries to pass together or dribble from there. If the first pass to the player nearby goes forward then basic principle #2 has also been achieved (play forward). To create the ideal field occupation, we preferably play 4:3:3 in the youth. In ball possession we try to create as many triangles as possible. In the midfield we play with 3 players. 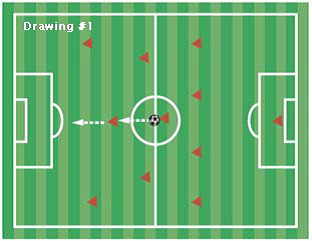 In offense we play with a right forward and a left forward (drawing #1). In this series we will discuss the various tactical principles that occur in youth soccer. In part 1 we will start with ball-possession of course; that is the starting point in the Netherlands, isn’t it? Once you have the ball you start with the build-up. In the build-up it is very important that a player passes the ball perfectly to a teammate. Over a short distance a player does that with the inside of the foot and over a larger distance with the instep, if a youth player is physically able to do so. What are the points a youth coach should look at when practicing passing? that during practice. The ball always has to do the work. √ Offer practice situations in which it is made obvious to the youth players that sometimes a ball must be passed hard and other times a ball must be passed soft; for example if the player receiving the ball has more time. √ If the players are a little older, the coach can spend more time on a good variation between short and long passes. Be sure to include the important cross-pass, which can be a very efficient weapon. Obviously you can only practice this if the youth player physically can execute such a pass. If needed, one extra player can get involved to transfer the ball from one side of the field to the other side. √ The player that receives the ball must ask for the ball (get away from the opponent). √ Good positional play means that the ball will be played back and sideways as few times as possible. 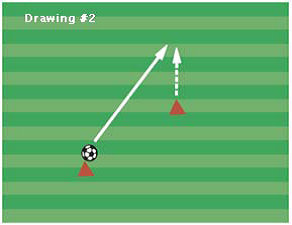 √ A pass to a teammate should be played in front of him and not behind the player (drawing #2). √ When one-touching a ball one must pass the ball into the team-mate with the correct speed and on the correct side of the player. The player receiving the ball is then able to one touch the ball to a supporting teammate. Thus the players automatically create the triangles that are so crucial for good positional play. 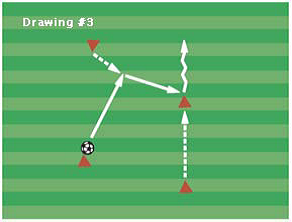 One player concentrates on the pass, one concentrates on receiving the ball and one supports in such a way that he can receive the ball (drawing #3). Whatever the playing style and formation, it is most important to get into open positions by movement. Explain to a youth player that if he moves with an opponent to a certain position, then space will open up there where the player just was. √ Talking to each other means you are helping one another and that is crucial on the field. √ Understand that your teammates can make errors. The goalkeeper is the first attacker. Too often it is forgotten that the build-up starts with the keeper. If the defenders and midfielders are covered by the opponents, then a long kick can be the solution. But, definitely with the younger players, it has preference that the keeper throws the ball to one of the midfielders or defender. Accept as the coach of the team that this can go wrong and even result in goals against. Build-up from behind fits perfectly into the before-mentioned basic principle; just play and have fun.